Not sure if this should actualy be rejected or not... its true, it could look more cowlike, but is it that important? FWIW, Gentoo's cow seems to be the same as the cowsay default. There doesn't seem to be any reason to downgrade APT to such mainstream cow technology. Adding a Launchpad task to ensure this cow really looks like a cow in comments -- because it currently doesn't! We currently don't preserve whitespace after the beginning of the line, which is the cause of the problem here. We probably should be replacing runs of whitespace (both leading whitespace and embedded whitespace) with the pattern " &nbsp; &nbsp; ... &nbsp; " such that the run ends with a normal whitespace (so that if the line gets wrapped, we don't have a space at the beginning of the next line). I consider (oo) nostrils, so it's perfectly fine cow pointing its nose at me. well, why not this one? This wouldn't be called a "bug" but is still an interesting thing to bring up as it is an easter egg. Is this bug fixed in Gutsy? I hate to be the bearer of bad news on this issue, but cows don't have horns. In theory, cows can not speak either. Which is probably why they're so tasty. > In theory, cows can not speak either. Which is probably why they're so tasty. this exchange of messages ( last 3 ) had me crying with laughter. I'd say it's a goat. We should fill a bug for the command used. It should have been apt-get méééh or apt-get baah. I think we should just put our tail on Gentoo's cow. Perhaps we could add some grass for the cow to graze on. The alternative by Fernando Ribeiro is really nice. Looks like an Intrepid Ibex to me. Yes, cow don't look like cow. Very bad, I am truly disappointed with the quality of this feature. like the gentoo's version! It's very easy to undo this modification if desired! Man, I tried the to use the "&nbsp;" but it messed everything up.
. . . . . . . . . . . . . . . . . . . . . . . . . . . .IT'S A TRAP!. . .
. . . . . . . . . . . . . . ,-‘ : : : :::: :::: :: : : : : :º ‘-, . . . . . . . . . . . .
. . . . . . . . .,-‘ / / : :: :: :: :: : : :::: :::-, ;; ;; ;; ;; ;; ;; ;\ . . . . . . . .
. . . . . . . . /,-‘,’ :: : : : : : : : : :: :: :: : ‘-, ;; ;; ;; ;; ;; ;;| . . . . . . .
. . . . . . . /,’,-‘ :: :: :: :: :: :: :: : ::_,-~~,_’-, ;; ;; ;; ;; | . . . . . . .
. . . . . _/ :,’ :/ :: :: :: : : :: :: _,-‘/ : ,-‘;’-‘’’’’~-, ;; ;; ;;,’ . . . . . . . .
. . . ,-‘ / : : : : : : ,-‘’’ : : :,--‘’ :|| /,-‘-‘--‘’’__,’’’ \ ;; ;,-‘ . . . . . . . .
. . . \ :/,, : : : _,-‘ --,,_ : : \ :\ ||/ /,-‘-‘x### ::\ \ ;;/ . . . . . . . . . . .
. . . . \/ /---‘’’’ : \ #\ : :\ : : \ :\ \| | : (O##º : :/ /-‘’ . . . . . . . . . . .
. . . . /,’____ : :\ ‘-#\ : \, : :\ :\ \ \ : ‘-,___,-‘,-`-,, . . . . . . . . . . .
. . . . ‘ ) : : : :’’’’--,,--,,,,,,¯ \ \ :: ::--,,_’’-,,’’’¯ :’- :’-, . . . . . . . . .
. . . . .) : : : : : : ,, : ‘’’’~~~~’ \ :: :: :: :’’’’’¯ :: ,-‘ :,/\ . . . . . . . . .
. . . . .\,/ /|\\| | :/ / : : : : : : : ,’-, :: :: :: :: ::,--‘’ :,-‘ \ \ . . . . . . . .
. . . . .\\’|\\ \|/ ‘/ / :: :_--,, : , | )’; :: :: :: :,-‘’ : ,-‘ : : :\ \, . . . . . . .
. . . ./¯ :| \ |\ : |/\ :: ::----, :\/ :|/ :: :: ,-‘’ : :,-‘ : : : : : : ‘’-,,_ . . . .
. . ..| : : :/ ‘’-(, :: :: :: ‘’’’’~,,,,,’’ :: ,-‘’ : :,-‘ : : : : : : : : :,-‘’’\\ . . . . I know its not a cow but any chance we can get admiral ackbar instead?? If this feature is not fixed I am switching back to windows. This is a very crucial feature, and without it I can not get anything done. It's a killer here. My clients are re-considering their redeployment of Ubuntu 8.04 LTS because of the cow! apt-get itsatrap! not working for you? I've found a workaround: use aptitude instead. Even though aptitude moo just isn't the same, it will work for package management. Since when is an easter egg a bug?? Seriously, does superman looks like a normal human being, no cause he's wearing that costum. So should the super cow look like an ordanary cow? Offcourse not! It's true that gentoo's cow is more a usual cow but come on, we have are special cow and let it this way, don't open a bug for this! Now that its been recycled to digg, its full of stupid comments. > very crucial feature, and without it I can not get anything done. > Now that its been recycled to digg, its full of stupid comments. That explains it (I wondered about the sudden new intrest). How on earth can I trust a group of people that can't make an ASCII cow properly to make an entire OS?!? I'm going back to Windows. How can i trust a package manager that doesn't produce realistic cows? I'm switching back to slackware's gzipped tarballs. It doesn't look like a cow because it isn't a cow; it's a McDonalds Elk. Common mistake. Can someone issue a fix for this? I think the current "cow" looks a lot like a goat. Please, don't have a cow. The issue of how it looks is moot. This continued debate is udderly ridiculous. We should instead be focusing on how to beef up security. Did you mean an armoured cow? > how to beef up security. cowsay -f head-in.cow "In progress." This is a definite blocker, it affects one's ability to moo, I recommend setting severity to Critical as this is one of apt's few defining features. Please keep in mind that this bug made one of my friends switch back to windows. Fix it ASAP or you will lose Ubuntu users. workaround: thanks to dpkg-divert, one can display his own moo! How long do we have to wait, to get this crucial bugfix? 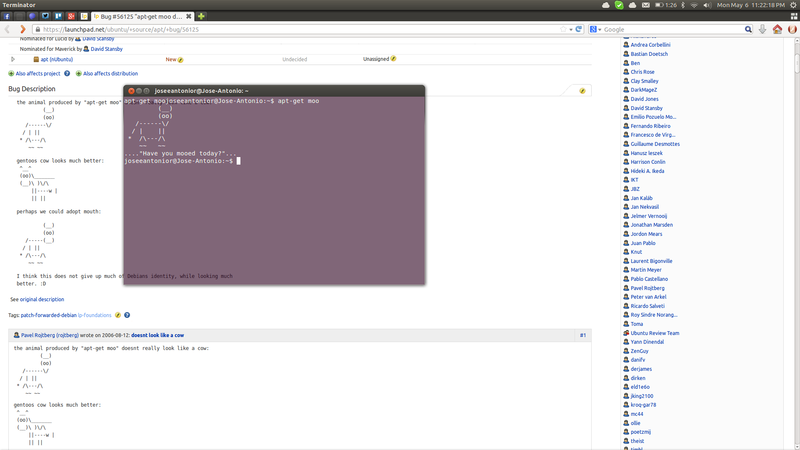 I can confirm this bug in apt 0.7.20.2ubuntu6 on Jaunty. As a fix I suggest this nifty cow, which I made specially for apt - it's completely original and nobody else uses it for any purpose. And it looks like a cow a lot, which counts. I think that with this new Ayatana project thing and surpassing Apple approach it's important to pay attention even to such a small details as a apt's eastern egg. Whats more, this allows us to finally close this bug and get some attention from media for Ubuntu (I'm looking at You, Digg). Let the world know that we care. Whoops, Lunchpad messed up my ASCII art, despite all efforts. 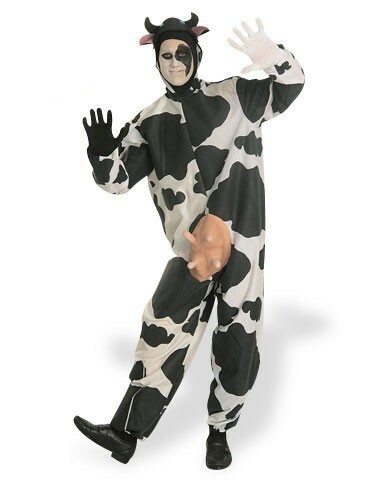 Please check the cow.png for refference. APT provides two standard cows: the "old" cow and the cow from Fernando Ribeiro accessible with "apt-get moo" and "apt-get moo moo". This should be suitable for most users. For the more advanced users: Possibility to dynamical add (or replace the defaults with) other cows with config settings. See attached patch for implementation details. I suggest that bug #1 should be marked as dependent on this bug. Can someone check if this is reproducible with apt-build moo? If so, we will have to add the apt-build package as being affected by this bug and update the bug description. What about vegetarians? I think it is very meat-centrist to only have a super cow confined within the barriers of a ~120k executable. Super cows should be able to roam the filesystem freely! I think we should replace it with the meat-free "apt-get carrot". > should be able to roam the filesystem freely! > I think we should replace it with the meat-free "apt-get carrot". The cow is vegetarian, so vegetarians should be super-happy to have a mate in apt. OK folks, I'm really getting tired of this. We're at 910 - read my lips: ninehundredandten - shortly, and still no fix? And will someone please mark bug #1 as dependent on this one, as Alexandros suggested? Thank you for bringing this bug to our attention. However, a paper cut should be a small usability issue, in the default Ubuntu 9.10 install, that affects many people and is quick and easy to fix. So this bug can't be addressed as part of this project. -This is not a usability bug. Hence not a papercut. I suggest a big and dramatic fix for the bug is appropriate and in line with the goals of Ubuntu. An appropriately cow-like image provides a sense of usability and a friendly 'can-do' attitude that encourages the user and generously manifests a sense of well-being. On the other hand, previous suggestions involving Ackbar and other non-sequitur enhancements gives everyone a strong pat on the back when they feel like nothing they do makes any sense anymore. As a compromise, perhaps a bovine species involving a fantastical graft of Ackbar's head onto the body of the animal may be the most 'apt' solution. After all, a super cow must distinguish itself aesthetically and otherwise. I would just like to thank the above comments for entertaining me for the afternoon. That is all. Still an issue in Ubuntu 10.04 LTS. It does not look like a cow! Update -- Gentoo's moo now looks like this. Where can I download the source code for apt-get? I've found the code for aptitude and making changes to the apt-get moo is pretty straightforward. Where was the fix committed? Please don't change the status without telling why. lol, this is a bug? was it marked critical? Still not fixed in 12.04.2. "Who's the author of that cow, and what license does it bear? Ascii art is serious business too and shouldn't be reused or modified without permissions neither." Can confirm that the bug is back on 13.04 with the first cow being on apt. What about this fine lady? I've just made it from scratch, so license would be not a problem. Well, ASCII art is messed again here, so a screenshot should be a better option. Should be fixed since some time. Try apt-get moo moo. Normal moo keeps the classic cow. Confirmed, the super cow looks beautiful with apt-get moo moo and apt-get moo moo moo.